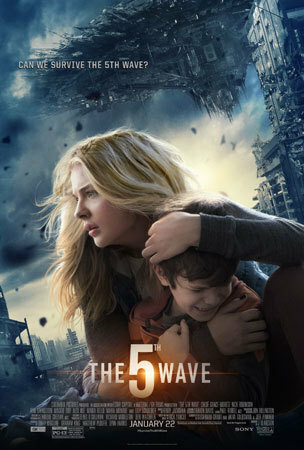 Kidzworld reviews the film version of the popular Sci-Fi novel The 5th Wave. Is Chloë Grace Moretz convincing as Cassie? What would you do to save your family if evil aliens invaded? In The 5th Wave, Cassie Sullivan (Chloë Grace Moretz) is in high school and crushin’ on cute jock Ben Parish (Nick Robinson). He barely notices her. What else is new, right? Uh, an alien invasion, that’s what. When extraterrestrials decide they want our planet they cut off our power (no more machines and that includes cell phones! ), then they cause earthquakes, tidal waves etc. wiping out most coastal cities and people in them followed by a world-wide plague that wipes out many more. Since they can inhabit our bodies, aliens create snipers to wipe out any stragglers. When her little bro is captured and forced to be a child soldier, can Cassie save him and herself? Cassie, a teen with a gun, runs through the woods and ends up at a gas station where she shoots a young guy because she thinks he’s an alien. Huh? In flashback we see that everyday high schooler Cassie loves her 5-year-old bro Sam (Zackary Arthur) and was on the edge of a romance with football jock Ben Parish when a ginormous spaceship parked itself over her town and the alien attack “Waves” began. 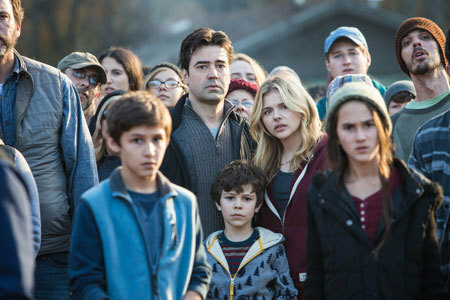 After her mom dies from the alien-induced plague, Cassie, Sam and her dad (Ron Livingston) have to go to a relocation camp. 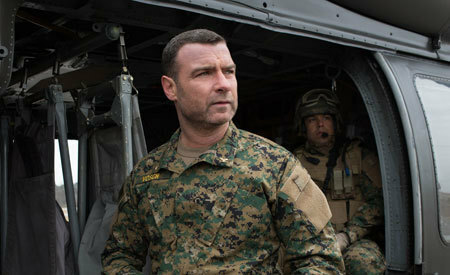 When U.S. soldiers, led by tough Colonel Vosch (Liev Schreiber) and Sergeant Reznick (Maria Bello) arrive, they separate kids from adults and cart the kids away “to safety”, including Sam. Cassie misses the bus and hides to see her dad and other adults killed. She grabs a gun and, learning that the kids have been taken to a local air force base, vows to find and rescue Sam. On the road alone, Cassie is shot by a sniper and wakes up in a farm house tended to by a hunky guy named Evan (Alex Roe). Evan’s family is dead so he joins Cassie in the trek to the air force base. On the way they start falling for each other as they fight off alien-possessed humans who’ve become snipers. Meanwhile, we see that Ben Parish is at the base being trained as a solider along with little Sam. Tough Resnick has shown Ben that many kids are possessed by aliens who live inside them. He is shown a new helmet with a vision sensor that, supposedly, can see if an alien is inside someone. Thrown out of another squad, feisty Goth chick Ringer (Maika Monroe) joins Ben’s squad and there is an attraction between them. The squad is sent out to fight, they are told, alien-inhabited humans. Ben hides little Sam at base so he doesn’t have to go. Some of the kids are injured or killed and Ben realizes that maybe the squad was lied to by the adult soldiers. With the squad in hiding, Ben, pretending to have been shot by an alien, returns to base to rescue Sam. 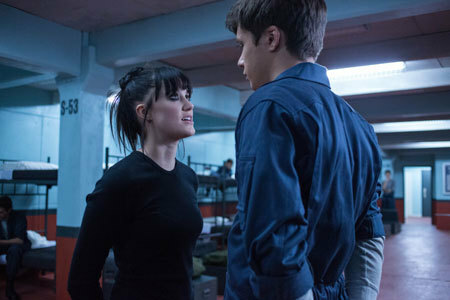 Learning that Evan isn’t what she thought he was, Cassie goes out alone and lets herself be taken by the soldiers to the base where she kills Resnick, runs into Ben and, together they escape while Evan secretly bombs the base. Pulling up in a Humvee, Ringer comes back just in time to rescue Cassie, Ben and Sam. What does the future hold now? Everything in The 5th Wave seems familiar; big hovering spaceship (Independence Day etc. 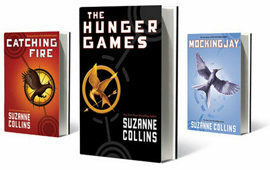 ), with adults dead or “taken over”, teens must save the world (every YA sci-fi book you’ve ever read), on and on. What made “The 5th Wave” novel so engrossing and readable was that the story was told through Cassie’s journal and her POV on what was happening was humorous, passionate, relatable and very real. What reads really well translates to film and dialogue as humorless, boring, kind of emotionless and so compacted that the slow-burning romance between Cassie and hunky Evan gets hot so suddenly that declarations of love seem very cheesy, corny and unbelievable. A lot of the plot, when unfolding in film, seems very illogical as well. We talked to book fans in our audience who liked the fact that the book is followed pretty closely but agreed that it didn’t really translate very well on film. 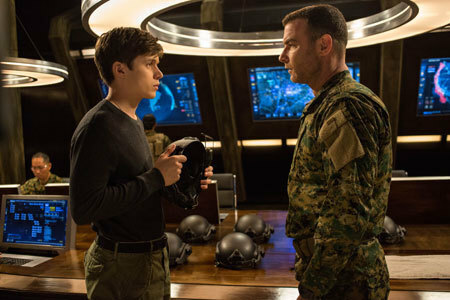 Despite honorable best efforts by Chloë Moretz, Nick Robinson, Alex Roe and veteran actors Mario Bello and Liev Schreiber, characters seem hollow or stereotypical. The Ringer character seems to translate to film best as portrayed by Maika Monroe. The film is set up well for future films in the series but we wonder if the franchise, as translated to film, can hold up. We go 3 stars. The 5th Wave is in theaters now! Did you read the book? Do you like the casting of the film? Couldn’t care less? Get a chat going with a comment below! Chloë Moretz is Cassie in The 5th Wave! Maika Monroe is Ringer in The 5th Wave! What's your favorite topic in sci-fi books?